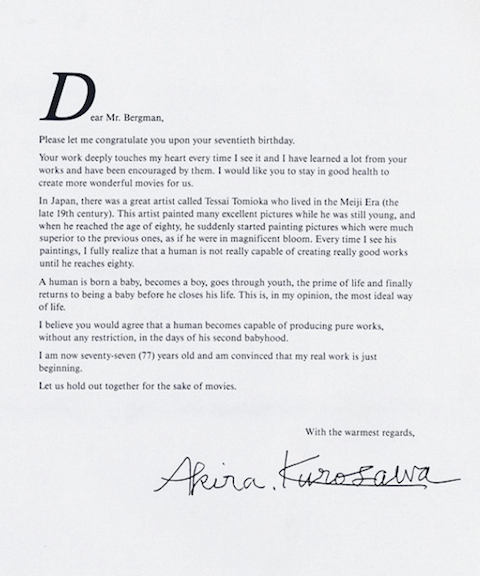 But no!, writes the Swedish director’s Japanese counterpart, Akira Kurosawa, the “real work is just beginning.” At least that’s how Kurasawa, then 77, felt about his “second babyhood.” Kurosawa wrote the letter above to Bergman on his birthday, professing his deep admiration. The feeling went both ways. The typically self-deprecating Bergman once called his The Virgin Spring a “a lousy imitation of Kurosawa” and added, “at the time my admiration for the Japanese cinema was at its height. I was almost a samuri myself!” Read the full transcript of Kurosawa’s birthday wishes to Bergman below (originally published in Chaplin magazine). How gentle,tender and wise Kurasawa comes across as a person and artist. The encouragement and humility are awesome. I will look up his favourite Japanese artist. this one is indeed kul.